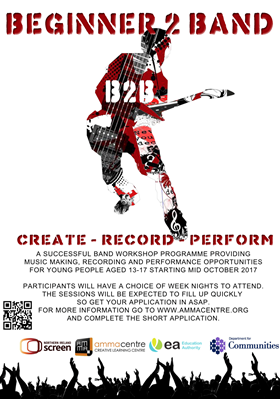 A successful band workshop programme providing music making, recording and performance opportunities for young people aged 13-17 starting mid October 2017. Participants will have a choice of week nights to attend. The sessions will be expected to fill up quickly so get your application in asap. For more information go to www.ammacentre.org and complete the short application form.